Cookie Lee, who turned her jewelry-making hobby into a nationwide empire of home-party consultants selling flashy trinkets and female empowerment, has sold her privately owned company. The deal, made public, caps Lee’s nearly 23-year reign as one of the most successful home-grown success stories in Orange County. Buying the firm is Debbie Millar, who with her husband, Ron, is founding partner of HÔM, a luxury residential real estate group in Newport Beach. The brokerage reported $1.4 billion in sales in 2013. “As I got older, I thought ‘What will happen? How can I continue a legacy, very much like how Mary Kay did?’” said Lee, 57, the effusive founder and now former president and chief designer of the Tustin-based business, in an interview with the Register. Neither party disclosed the terms of the deal, which has been in the works for several months. What’s clear is that Millar will be leading and further modernizing the firm, which went through a rebranding last summer. Lee will not hold an official company role but will help if needed, she said. The corporate hand-over is happening as the business is preparing to mark its 23rd anniversary in direct sales and expand its line beyond necklaces, bracelets and other adornments. During the past two decades, the “Cookie sisterhood” has grown to more than 40,000 independent consultants nationwide, with more than 6,000 in Orange County. Top saleswomen, who pocket half the value of every item they sell, have been known to earn more than $30,000 a month. 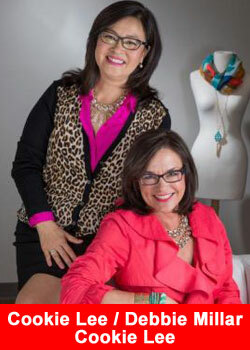 Lee views part of her legacy as creating a major brand in the competitive, direct-sale jewelry and accessory industry. It’s a $2.5 billion market that’s expected to shine again after some recession-related struggles along with increased competition from e-retailers and brick-and-mortar shops, says a February report from research company IBISWorld. The fashion and costume jewelry segment makes up 22 percent of the overall industry, or $550 million. The top two direct-sales jewelry players in the U.S. are Park Lane Jewelry and Stella & Dot, making up a combined 17.4 percent of total business, according to IBISWorld. Lee views the other portion of her legacy as provider of opportunities for women, many with husbands and children, to earn a paycheck through a home-based business. Her business model, she said, has allowed her to achieve great success without missing her children’s piano recitals, birthday parties or other milestones. And she strives to instill in her troops that same credo of mom first, saleswoman second. Millar is a perfect match, Lee said. The longtime friend has a background in fashion and direct sales as a former field leader at Stella & Dot. Millar, a mother of six, also understands the juggling act of running a company while raising a family. In 2010, she and two partners launched a direct-sales jewelry startup called BambooPink, which they later sold for an undisclosed amount. Taste is apparently something else Lee and Millar share. The duo showed up to the Register interview wearing matching Cookie Lee Golden Starlight necklaces. Lee, ever the fashion plate, wore a blouse of radiant orchid, Pantone’s 2014 color of the year. Their business relationship ignited last fall over lunch at R+D Kitchen at Fashion Island to casually discuss the future of the Cookie Lee operation. By the first week of March, Millar was introduced to Camp Cookie, an annual gathering of the company’s top sellers held this year in the Big Easy. Get more information, fact and figures about Park Lane Jewelry, click here for the Park Lane Jewelry overview.